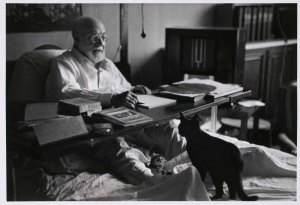 Henri Matisse in bed working, his black cat at his feet, Nice, August 1949. Photographed by Robert Capa. Henri-Émile-Benoît Matisse (31 December 1869 – 3 November 1954) was a French artist, known for his use of colour and his fluid and original draughtsmanship. He was a draughtsman, printmaker, and sculptor, but is known primarily as a painter. Notes of a Painter, 1908. Matisse on Art, collected by Jack D. Flam, 1973. Chatting with Henri Matisse: The Lost 1941 Interview, Getty Publications 2013.